FAIL. Another Obama-Funded Solar Company Goes Bust - Taxpayers Lose $2 Billion? FAIL. Another Obama-Funded Solar Company Goes Bust – Taxpayers Lose $2 Billion? Another Obama-funded solar company goes bust. 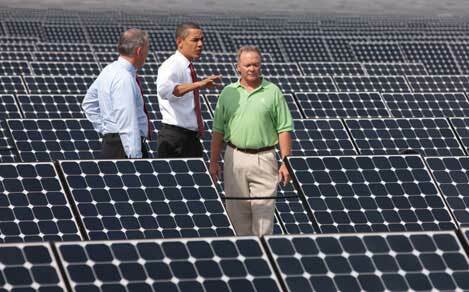 President Barack Obama tours a solar power generation facility in Arcadia, Florida Wednesday (Photo:WhiteHouse.gov). Solar Trust filed for bankruptcy protection on Monday. The company has held rights for the 1,000-megawatt Blythe Solar Power Project in the Southern California desert, which last April won $2.1 billion of conditional loan guarantees from the U.S. Department of Energy. Solar Trust said it ran short of liquidity after Solar Millennium AG (S2MG.DE), which holds a 70 percent stake, sought court protection in December. Taxpayers could lose $2 billion. But what’s another $2 billion among friends anyway?